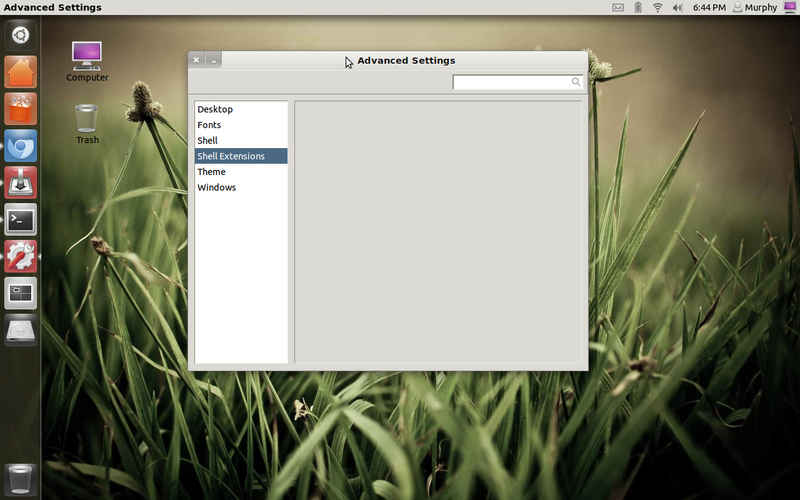 How to enable gnome shell extension?. When i click on gnome shell extension there is no ON button showing advanced settings --> shell extensions. In a youtube video I saw there is one ON button to enable shell extensions. i have allready installed gnome tweak tool and everything..
No need for a screenshot, just log out of your current session. If you're on 11.10, click the cog button above where you enter your password, and it will let you select gnome 3 as your shell. Then you'll be able to enjoy a far superior UI to unity for as long as you want. If you're using 11.04 I've heard you can't go back to unity after using it, because it messes with gtk2 (I don't know -- I never tried to go back), but the process is approximately the same, only this time the selection will be at the bottom of the screen, near where you select the keyboard. Not the answer you're looking for? Browse other questions tagged gnome-shell-extension or ask your own question. Why is Shell theme disabled in Gnome Tweak Tool?